Our Giant Prune plum trees produce very large harvests consisting of large red oval plums that have stones easily removed (freestone). They are not considered the best there is but you keep them around for one or two redeeming qualities, a bit like Fergie V's Dianna. 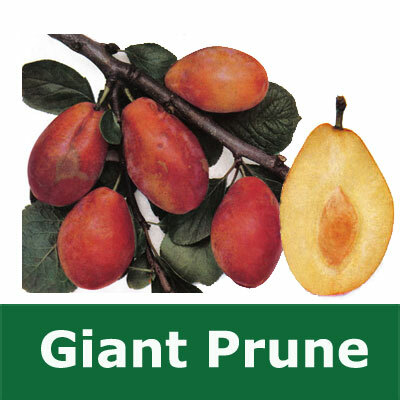 What the Giant Prune plum tree lacks in taste compared to other dessert plum trees they make up for with their very large harvests and durability. Giant Prune plum trees are classed as UK suitable plum trees so technically speaking you can plant anywhere including those places that have more sheep than people, electricity is a new thing and the local police firearms squad are armed with cross bows. We of course retract this offer if you are a light house keeper with only a tsunami battered window box as a garden. Good resistance to disease and frost.